I’m starting to get my running mojo back. I decided to run up Mt. Holyoke and then hike my way back down. I ran up the access road to the top rather than the trail because I am still being over cautious about injury. It was an awesome feeling making it to the top. It’s not a huge climb and only about 1.65 miles to the top, but it really gets the heart pumping. I took in the view from the top and then strolled down the trails for a total of 3.15 miles. I practiced a little trail running on flat stretches of trail. It was a leisurely hike down. As I was getting close to my car I greeted an older man who was walking his little furry white dog. The dog was bounding along quite happily. We said hello and then the man informed me that 6 months ago the dog was paralyzed! I said well she’s made a remarkable recovery and now I can tell you all about the dog, the man’s daughter who lives in Maine, his workout schedule, etc. People love to share their stories with me! This summer at our favorite little local lake, Carlos ran into a friend from school. When I walked down the small beach to get him to go home I met his friend’s grandmother and her friend. The grandmother’s friend suddenly began explaining that she was wearing a big floppy beach hat because she was in menopause and taking hormones and didn’t want to get a sunburn. I learned all about her daughter who was a new Chemistry teacher and more about menopause. It’s amazing what people will share! Later in the afternoon I had a phone call to make and I was doing some computer work at a coffee shop near the bike trail. It was a gorgeous day out so I decided to walk and talk. I was surprised that I ended up walking 4.35 miles. I moved for a total of 7.5 miles. I have been itching to do a long run, something more than 5 miles. 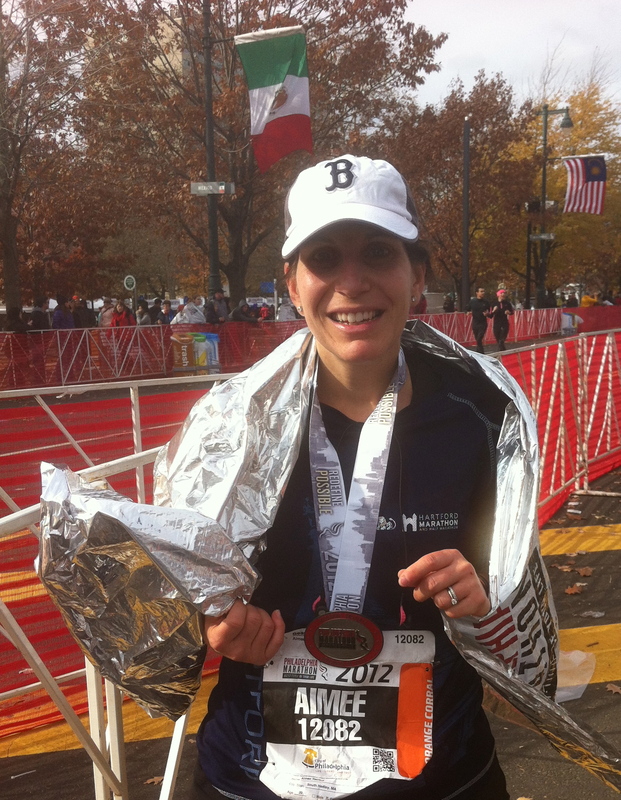 I had plans to run with my friend Kate, the one I will be running with in the Baystate Half Marathon next month. However, things didn’t work out quite as planned. I left the house and decided to run in her direction. I ran 4.47 miles before meeting up with her as she got delayed by a couple of unplanned issues. We then did some hill work and a mini boot camp of lunges, squats and tricep dips. The weather was really undecided, it was grey and gloomy, but a bit muggy and breezy. Rain was imminent and of course as we headed back to do more hill work it began raining. We decided to just get back on the road and run to my house. Luckily the rain fizzled out. I ran another 4.04 miles for a total of 8.51 miles! Back at my house we indulged in a little homemade facial. I made a face scrub out of almond oil and coconut sugar which smells divine! We cleansed our faces with my new Beauty Counter cleanser and then did the scrub. My skin felt so nice and smooth! Little known fact…I really wanted to be an esthetician when I was in high school. I used to practice doing facials on my friends and family. I was so interested in it my mom took me to the Elizabeth Grady School in Boston for a tour and informational session. Of course once my friends started looking into colleges I wanted to do the same. I am still interested in skin care, but these days I am more interested in how to care for the skin as naturally as possible by eliminating chemically laden products in exchange for more natural organic remedies. Something tells me at some point my career path might come full circle. I have been itching to get back into strength training. I hit the gym after bringing Carlos to school. I didn’t have much time, but managed to fit in a good 45 minute session including a quick warm up on the bike. I am aiming for one day a week at the gym. Later I met my oldest and dearest childhood friend for lunch. It was a belated birthday lunch for me. It’s always nice to catch up with her as we don’t see each other too often. She is a busy nurse practitioner with 4 sons! She had 3 of her boys long before I had Carlos. As kids we used to talk about how we would live next door to each other in California and have children at the same time. Well by the time I got pregnant with Carlos I figured that dream was long gone. Ironically she got pregnant a few months later with her fourth son. Carlos and Domenic are great friends and although they don’t see each other often they act as though no time has passed when they do get together just like their moms. Now I just have to figure out how we are going to live next door to each other in California! I brought Carlos to soccer practice in the morning and went for a run while he was there. It was a really enjoyable 4.36 mile run. After practice we went home so I could shower. We picked up our farm share, went to Barnes & Noble to pick up a gift card for a birthday party that afternoon and back home for lunch. The birthday party was for one of Carlos’ new school friends. He loves to dance and takes dance lessons. His mom said he really wanted a dance birthday party so the studio let him have the party there. The two dance instructors spent about a half hour teaching the group of kids a short dance to one of the songs in the most recent Muppets movie. Then the kids performed the dance for us. They had cake and ice cream in the lobby area before going back into the dance room for another performance. The dance instructors put other music on and led the kids in a little freestyle dance party. It was nice to see the boys participating too and having so much fun. My husband is a great dancer and Carlos has inherited the natural rhythm that every Mozambican boy seems to be born with thankfully! I ran 4.40 miles at my happy place, Ashley Reservoir, for a much needed run after work. At home I whipped up my favorite black bean and corn salad for an afternoon barbecue. Carlos had skating at 11:30. At 1:30 all went to the barbecue at the house of one of his class mates later in the afternoon. This new school is very small. There is a strong sense of community. This family invited the entire class over to get to know the families. The teacher and one teaching assistant also came. It was a beautiful afternoon. There was tons of homemade food. The company was enjoyable. It was so nice to chat with everyone, get to know the parents and kids a little better and make ourselves more visible. Carlos is settling in very nicely and we are beyond thrilled with the transformation we have seen in him in the short time he’s been back at school. So how was your week/weekend? Wow Aimee….you fill your days well…lots of activity which is great…I find it much more difficult to do that, but I think it’s all about me not making it a priority. I can’t believe you ran UP Mt. Holyoke…you go girl! That’s so interesting that you wanted to be an esthetician. I’ll volunteer for a facial any day 🙂 In fact, one of the ICU nurses was telling me that she had just had a facial done and it was glorious! I think people are notoriously apprehensive of things that they don’t know about. So in regards to Carlos’ school, I’m sure that is what is going on…we are all so conditioned to think only of the regimented (and repetitive and boring) grade schools. I think a school that let’s a child fully immerse in topics that they have a passion about is awesome and instills a great love of learning. Such a good mix of running time, hiking time, friend time, gym time, parenting time, parent networking time, etc. It just sounds so well-balanced!